India is a land of rich cultural heritage and our country depicts traditional and cultural significance from the ancient days. This country was ruled by Hindus, Muslims and Christians; during their rule, incredible structures were built depicting the artwork and culture of Hinduism, Buddhism, Jainism, Sikhism, Islam and Christianity, which continue to exist as our legacy from the past. Heritage photography is an absorbing genre which transports the photographer to the ancient world, inspires the artist to capture the expressions and art of the magnificent antiquated centuries in the form of creative photographs and pass it on to the future generations. 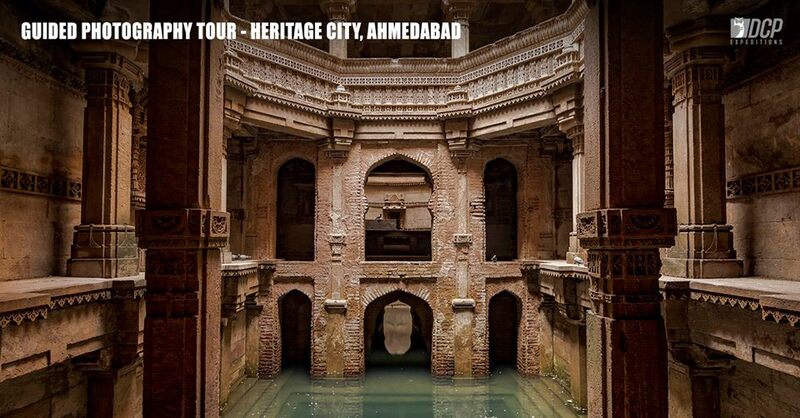 Heritage photography workshops presents opportunity to click images of the caves, temples, beauty of sculptures discovered from the ruins, themes and stories carved on stones, sculptures made on blocks of solid rocks, figures carved out of stone and bronze, sculptures of gods and goddesses… the list is unending. The 600 years old city of Ahmedabad was the first city in India to be declared as a heritage city by UNESCO. The people, the culture, the market places, the ancient Indo Islamic monuments like the Sidi Syed mosque, Juma masjid, the community based residential areas called Pols, several temples, old heritage houses showcasing beautiful wooden carvings – everything out together, the old city of Ahmedabad is paradise for a travel photographer. Step outside with your camera; smell and experience mesmerising city with the team. The day starts with a visit to the old Swaminarayan temple. The temple offers many photography opportunities. Following that, we will be visiting Juma masjid and Siddi Sayed mosque. Come back to your hotel, have lunch and take some rest. In the evening we will be visiting the famous step wells of Adalaj and Ambapur, some fine examples of the ancient architecture. Come back to the hotel, have dinner at the famous Manek Chowk, the best place for foodies in Ahmedabad. Get up early in the morning. Today we will be exploring the famous community residential areas called Pols. Some amazing photographic opportunities await you in the narrow lanes. Come back to the hotel by 11 am for lunch. After taking some rest, in the evening, we will venture out for Kakaria talav and Sabarmati river front. Those who want to reach back Mumbai next day early, can catch a train in midnight. There are many trains connecting Ahmedabad city with Mumbai, which reach early in the morning. Alternately check out early in the morning and travel to Mumbai. Carry battery charger. Carry extra pack of camera batteries. Carry backup memory cards / HDD storage drives, Laptop. Equipment is available on rental – please mail us at rentals@dcpexpeditions.com. Accommodation for 2 nights and 2 days. Breakfast, lunch and dinner during the stay. All park charges, entry fee etc. DCP photography expert for 2 days.